Anand 'Kav' Kaviraj is the master of Silver Age Comics. 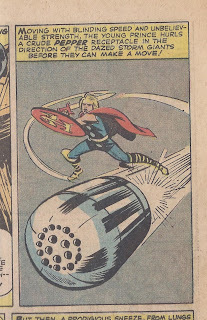 He finds some strange and wonderful things in those old school comics. 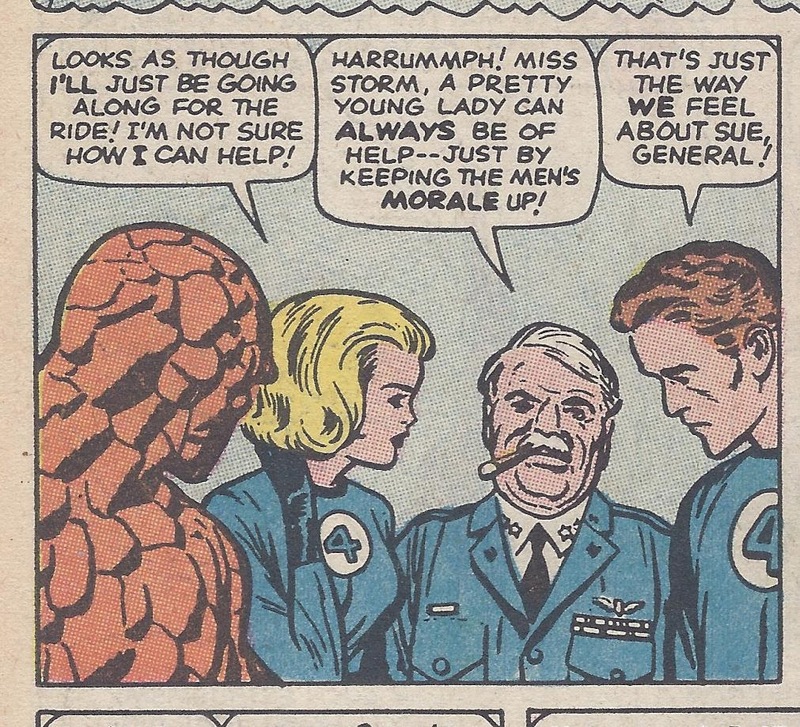 Today he has discovered that ol' Thunderbolt Ross thinks a woman's role is to look pretty in Fantastic Four #12. Ok, here we have a scene from Fantastic Four #12 which is typical of the way Sue storm was treated as a useless female. Never mind the fact that she controls a force-field, but apparently all she's good for is 'keeping the men's morale up' like a friggin' CHEERLEADER. Yeah Thunderbolt Ross, maybe she could bake some cookies while the boys tackle the Hulk. Anand 'Kav' Kaviraj is the master of Silver Age Comics. 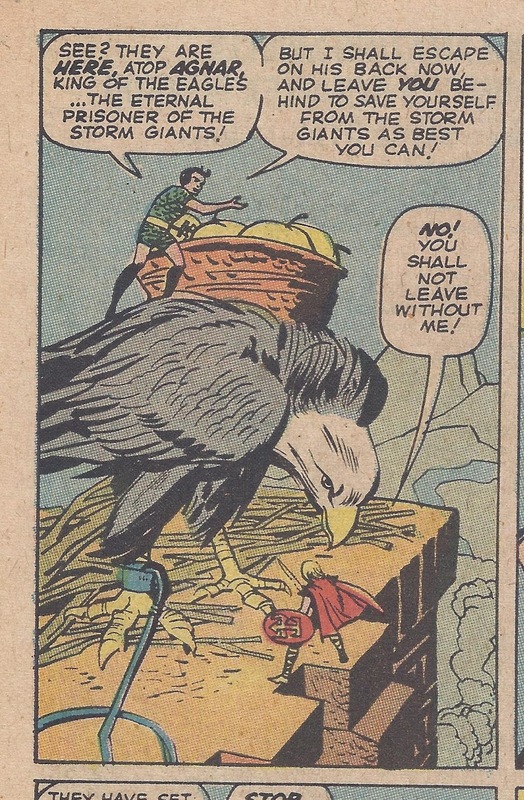 He finds some strange and wonderful things in those old school comics. Today he has discovered a Dr. Strange that's not the Dr. Strange we all know and love. Ok here's an odd one from Tales of Suspense #41 where we see 'Dr Strange' who is some weird villain. I guess Stan Lee forgot he used that name already when he went to create the Dr Strange we know later on. Anand 'Kav' Kaviraj is the master of Silver Age Comics. He finds some strange and wonderful things in those old school comics. 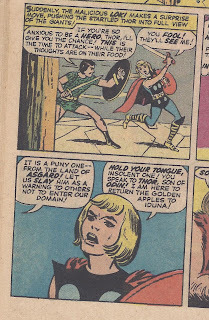 Today he is sharing four cool panels from the reprint of an annual Tales of Asgard #1. 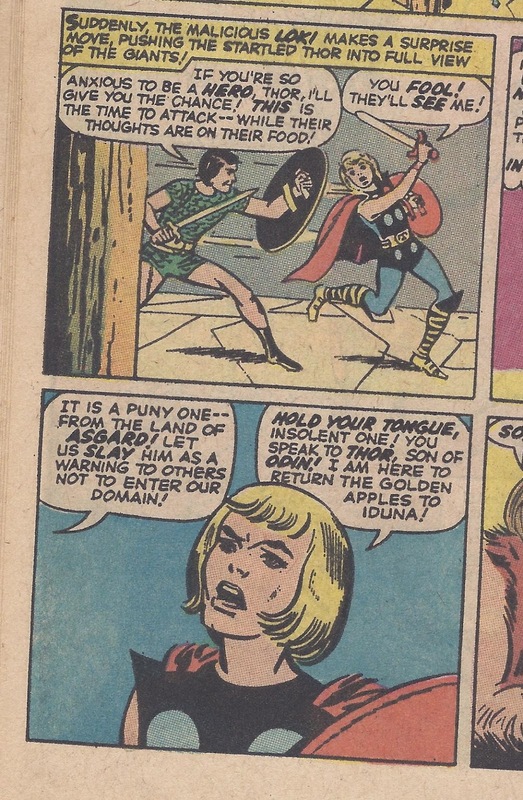 Here's a special treat from an early Journey Into Mystery issue which is possibly around issue number 85 titled 'Tales of Asgard'. 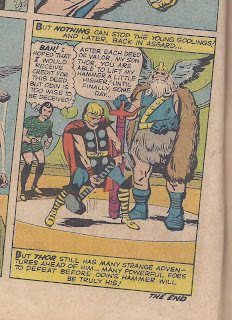 Stan Lee was scripting direct from Norse mythology where we see a young Thor and Loki in action against some giants. 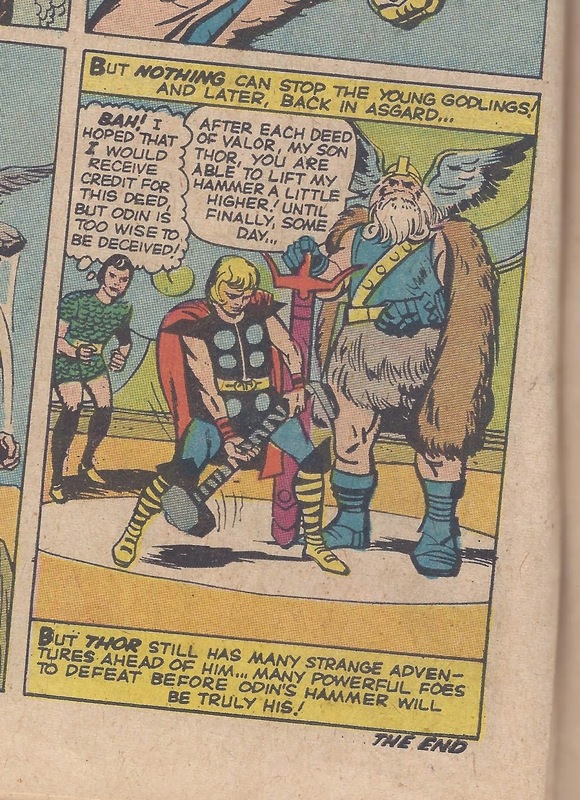 We see Loki's propensity for evil, but we see Thor slowly being able to lift Uru higher each time he completes a heroic feat. Awesome stuff! Anand 'Kav' Kaviraj is the master of Silver Age Comics. He finds some strange and wonderful things in those old school comics. 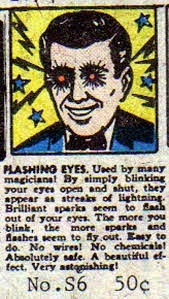 Today he has found another only used once superpower for The Fantastic Four. One thing about the early Fantastic Four comics was that the powers of the foursome fluctuated wildly from Mr. Fantastic turning himself into a human chain with SEPARATE links to this panel. 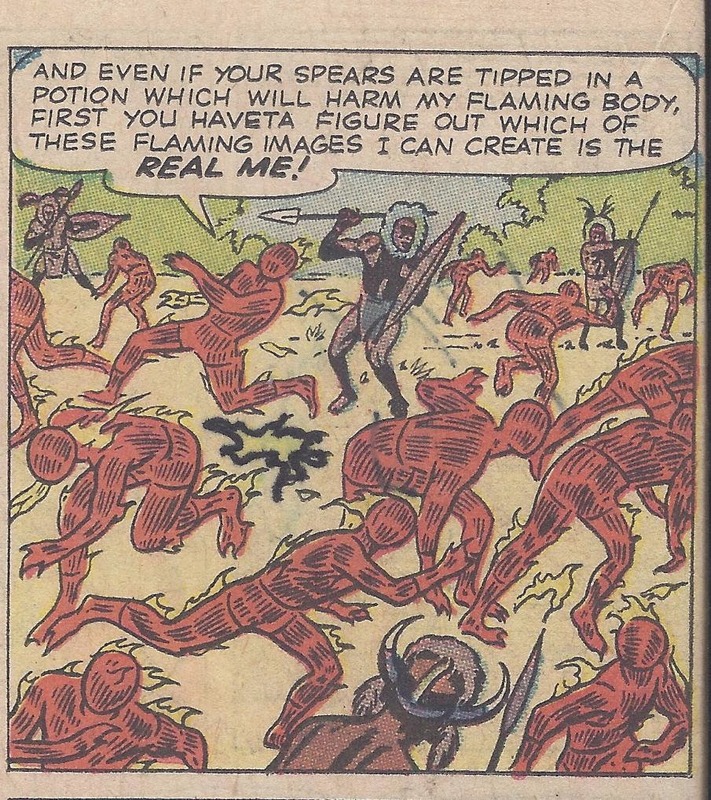 The Human Torch can apparently make running flame figures of himself!!! WTF? This is even worse than when The Flash made his costume perambulate to fight crime. PS Johnny-they can easily figure out the real Human Torch is because he's THE ONE TALKING!!!!!! Anand 'Kav' Kaviraj is the master of Silver Age Comics. When Kav finds a mistake in his Silver Age collection, he likes to share it with the faithful followers of Champion City Comics. 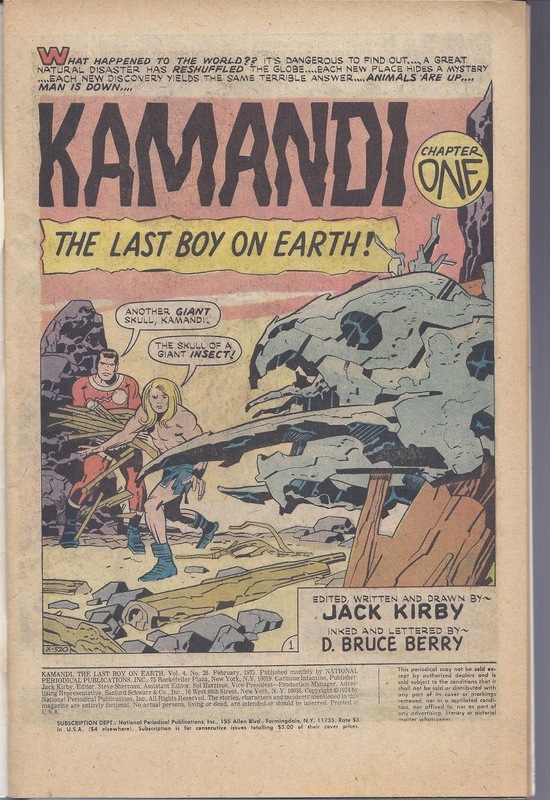 Today, he has found an error in Kamandi #26, which was published in 1975 by DC Comics. Jack Kirby was the writer and the artist. 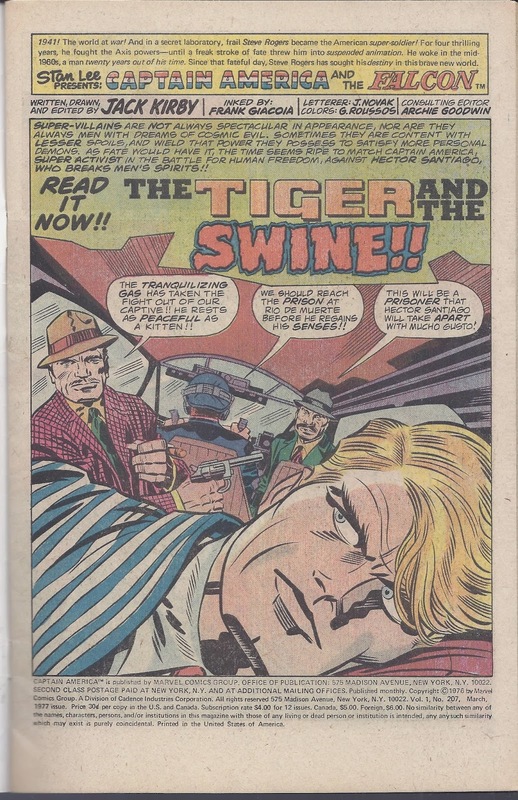 Jack Kirby was the MASTER, but he was awful at two things: using quotation marks incorrectly and science. Here's a bad science example from from Kamandi #26 the 'Last Boy on Earth' spots an 'insect skull' (note correct use of quote marks, bro). Note to Kirby: INSECTS HAVE EXOSKELETONS NOT SKULLS!! 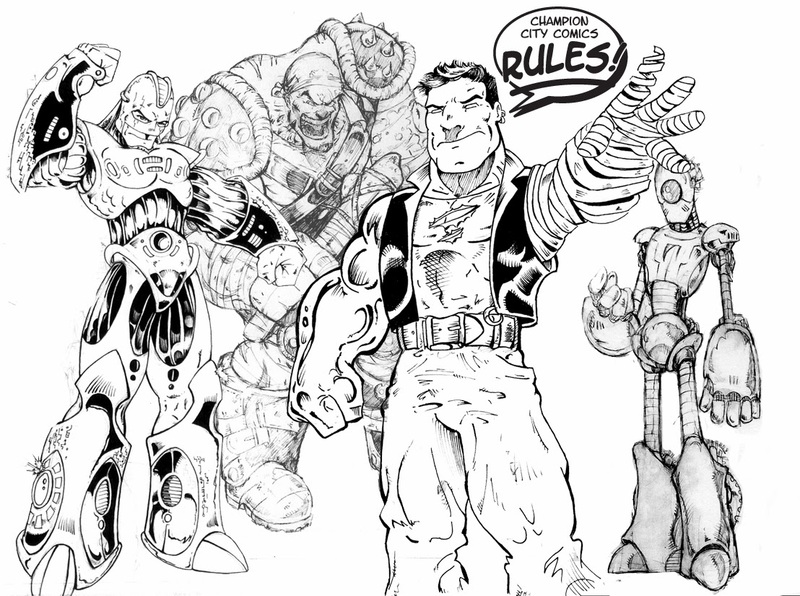 A special thanks to David Phifer from Mod City Media for submitting an amazing drawing just for Champion City Comics. 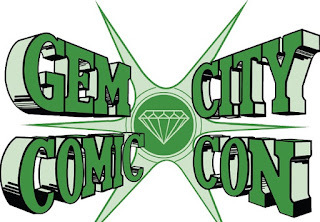 I met David at GrandCon 2013 in Grand Rapids, Michigan and he has joined the ranks of Champion City Comics. I plan on showing more of David's work at Champion City Comics. Enjoy. Danos Philopoulos submitted a great creator owned comic book to Champion City Comics titled Origin of Legend. Origin of Legend is a dramatic retelling of the life of the Greek mythical creature Cyclops presented as a misunderstood and feared creature. The story has been published in past in the anthology Uncanny Adventures by 8th Wonder Press. There are some personnel changes for The Red Devil, our original webcomic series. Artist Erik Roman is taking time off from the story, but is being replaced by Joe Haemmerle who has been our artist in the past. L. Jamal Walton is now handling the color work for our story. Cristian Docolomansky will continue to do the inking while Magnus is our letterer. I would like to share with you an upcoming panel that was pencilled by Joe Haemmerle and inked by Cristian Docolomansky. Enjoy! Superman and Batman had no break in their comic run from the Golden Age of Comics to the present. Not so for other super heroes. Golden Age Flash and Green Lantern stopped printing and were reworked and re-introduced during the Silver Age of Comics. 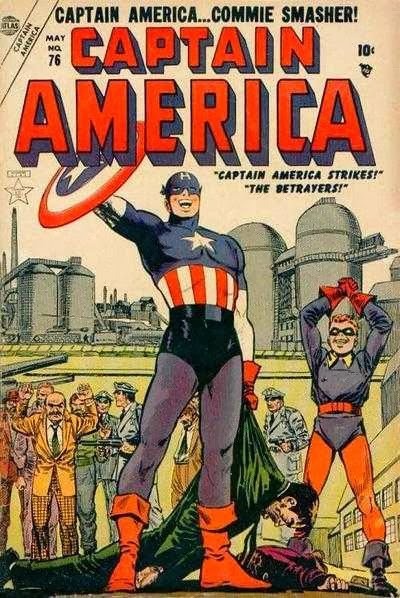 Captain America has the strangest history because he's the only Golden Age hero, besides arguably Namor (The Sub-Mariner), to have their series ended and then reintroduced as the same character during the Silver Age. 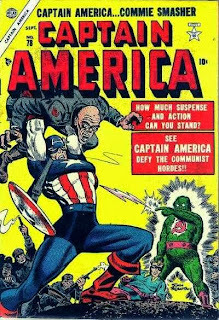 Issues #74 and #75 were published right after issue #73, in 1949, but they were called Captain America's Weird Adventure Tales. 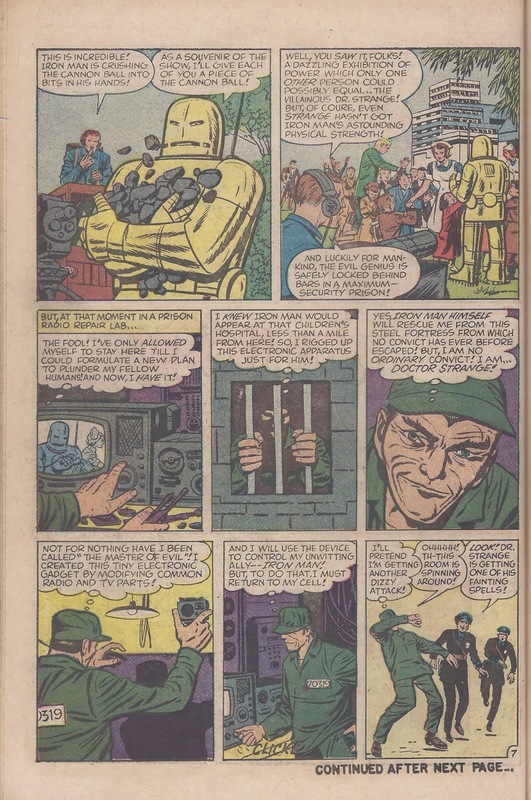 Issues #76 thru #78 were published in 1954, 5 years later. Showcase #4 (the first Flash appearance) which many consider to be the start of the Silver Age of Comics didn't appear until 1956. To further complicate things after Captain America appeared in Avengers #4 Marvel claimed that the man in #76 thru #78 was not Steve Rogers, but a different man. Thus some consider #73 to be the last Golden Age Cap; some consider #78 to be the last Golden Age Cap and a few consider #75 to be the last Golden Age CAP. There's another reason that they started the Silver Age Captain America comics with issue #100. There are no Captain America #79-99.... weird. Anand 'Kav' Kaviraj is the artist for Rapid City, Doctor Death vs The Vampire, and Dr Death vs The Zombie. I would like to wish everyone a happy new year. 2014 will be the fifth year that Champion City Comics has been in the webcomics business. Enjoy your day!